This collection brings to you the traditional coir mattresses with a twist. These improved coir mattresses are a complete package that lead you to a world of sweet dreams and blissful sleep. It's state of the art 3-way Anti-Sag technology ehances durability and high density rubberized coir offers extra firmness to your back. 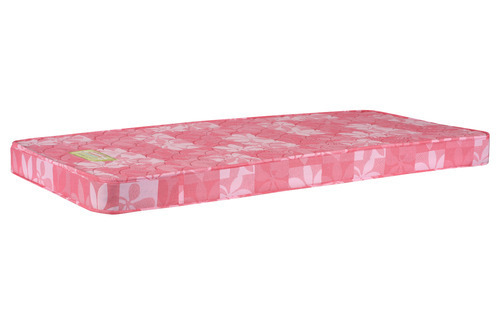 This range has well-designed mattresses with different comfort levels for different body needs. Thickness Customize as per demand. Size Customize as per demand. Ultra comfort mattress for a good night sleep everyday! - A 4.5” extra bounce mattress with highest level of comfort in this bracket comprises of HD foam laminated with ISI marked coir sheet. It comes with exquistely designed fabric cover. A real value for money mattress in the series. Offered mattress is designed under the supervision of our capable professionals using quality assured foam and modern machines. Available in numerous sizes and thicknesses, provided mattress is highly demanded in homes, hotels and other places for its optimum softness. Coirfit Synergy mattress is a traditional coir mattress with a twist. It's state of the art 3-Way Anti Sag Technology ehnaces the durability and high density rubberized coir offers extra firmness to your back. The exclusive body balanced design adjusts the hardness and softness thereby making the right weight balance. The unique treatment inhibts the growth of bacteria and fungus, keeping the mattress sanitized and fresh. The granular construction allows fast air circulation, thus keeping the body cool and comfortable. An extra bounce mattress is a combination of isi marked rubberzied coir sheet laminated on HD PU Foam & HD Rebonded Foam with quilted cover. It's state of the art 3-Way Anti Sag Technology increases durability and High Density Rubberized Coir offers extra firmness to your back. The mattress combines the best of sleep science and material to bring you luxury. The granular bonded construction of the mattress adjusts with the surroundings and keeps the user comfortable in all weathers. Made with natural fibre, the mattress is free of any chemical application which is an added bonus for environment lovers. With anti-dust quality, the mattress is not just perfect for adults, but for elders and kids as well. A healthy option for those who want stiff support and bacteria-free environment. The rubberized coir has spring like quality and does not retain moisture. With better breathability and temperature regulating properties of this mattress, you no longer have to complain about feeling hot or too coold as it provides the perfect temperature for a euphoric sleep expereince.